Anders, tell about the championship, please. – The Swedish nationals were held in Avesta, about 150 km northwest of Stockholm. It was a two-day event with record number 260 participants in total from 32 clubs. 32 clubs who are all registered and recognized by the Swedish sports government due to the organizational work that has been done the past year. This is also the main reason for the growth in participants, about 10% more than ever before. There are now 32 homes for armwrestlers around Sweden. What was the most interesting fights and who was the most successful athletes, as for you? – There are a few athletes in seniors who are dominant, on the women side Maria Lundqvist in -55 the worlds silver medalist, winning left and right, Felicia Rydstedt doing the same in -70, and of course Fia Reisek in -65. Elin Janeheim doubled in the junior, and won left arm senior, but on the men’s side our hopes are higher than before. Swedish armwrestlers are developing, and names like Niklas Nannestad, Patrik Berg, Glenn Bengtsson, Johannes Andersson, Anton Pettersson and others are all with the potential to reach at least top 5 at worlds. The situation with Swedish men is very different now from a few years ago, and if international opponents are not careful, they will be surprised. Did you hold a para-championship for first time? Will it become regular? 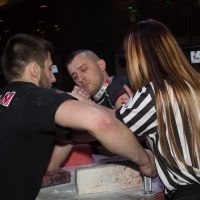 – The para-category was held for the first time in at least ten years, although this time with only four athletes, it will be regular, and the federation is focusing on the development of the para-armwrestling. It has taken to long allready, and we will try to bring it to the same level as the rest of Swedish armwrestling.